Marketers would have you believe that product is “So Easy a Caveman Can Do It” (Geico). However, what the public doesn’t usually see is the time and effort put behind that product. In the world of fiber optic networks, a carefully constructed network requires calculated planning and a high level of expertise. It’s not so easy, that anyone can throw up some cables and call it a network. With this, comes a level of knowledge beyond the average Joe. Below are just a few of the techniques required in the process as they relate to construction of the network. There are two main types of land based network fiber optic installation: aerial and underground. When installing a fiber optic network, several factors are taken into account before construction may begin. Factors include: construction costs, time constraints, existing infrastructure, federal / state / local influences, etc. Each technique has different pros and cons, which influence the decisions for a given network. Below we outline several advantages and disadvantages; however, these are not all encompassing but represent some of the key variations between the two methods. As in any business, the discussion of cost factor often arises. When we talk about aerial and underground fiber installation, this is one of the influences that we consider. Notably, aerial construction tends to be cheaper than underground construction, in terms of pure construction costs. However, other factors play into this installation; make-ready in particular cannot be generalized, making cost comparison a moving target. For the purpose of this discussion, we will not discuss cost-efficiency of construction, as that’s a whole different animal for another day. Aerial fiber construction is the process by which fiber optic cable is installed along a line of utility poles. In placing aerial cable, a support strand is needed in addition to the cable. Some aerial fibers are pre-lashed to a support strand, making placement less complex. Strands can also be placed along the route first, with fiber pulled and lashed to the support strand later. Lashing is the process of securing the fiber cable to the support strand via lashing wire. When placing cable on a pole, the required spacing distance varies depending on the type of cable or equipment. These requirements are often set by local, state and national standards like the NESC or for instance, in California, the GO95. Fiber installation that occurs when fiber optic cable is installed under the ground in pipes, or conduits, is known as underground construction. 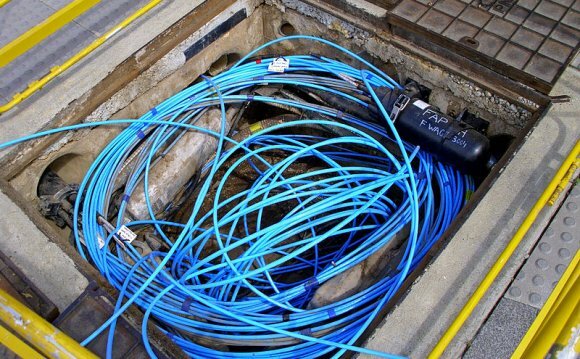 In this case, the fiber cables are buried in a trench. Depth of the underground cables varies by many factors; however, it is typically between 12-36 inches below surface level. In colder areas, fiber cables are typically buried below the frost line to prevent the cables from being damaged. Many companies and contractors build extra conduits along the route, to prevent future digging for additional cable installations.